The 25th Jesus Surf Classic comes to its North Devon home of Croyde Bay once again over the weekend of 9 – 10 September, with the Groms (U12) division continuing, along with seven other categories and, weather permitting, the mobile skatepark back again. Because it’s a significant anniversary we hope to have one or two extra attractions as well to help make the event a fantastic weekend. 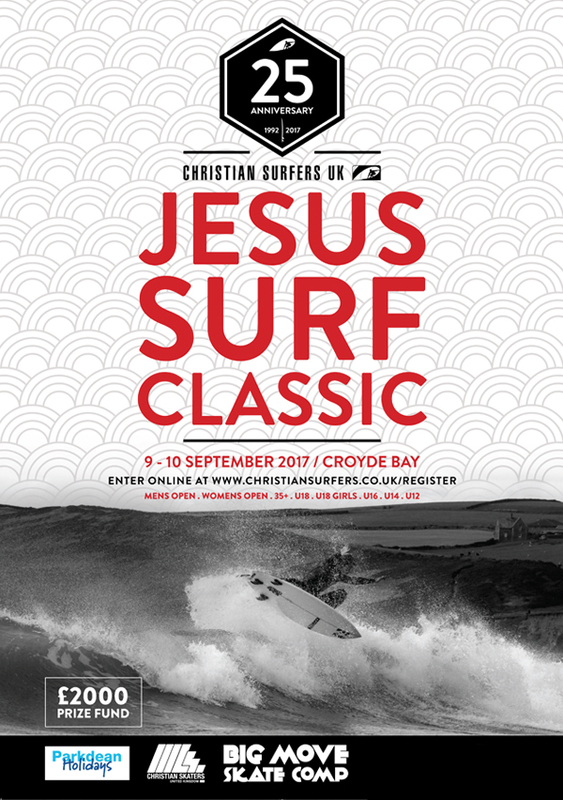 The Jesus Surf Classic is organised and run by Christian Surfers UK and this year there is over £2000 of prize money to be shared between the eight categories, with the Open Men’s surfing champion receiving £300. As last year when we increased the Women’s Open prize money to our highest ever amount, the winner’s cheque will be £300, the same as the Open Men’s winner. Last year’s hugely successful 24th event was well oversubscribed, with over 150 entries, so contestants are being advised to get their online entries in early. You will be advised again when registration is open, but probably around early July. As before, over 100 Christian Surfers volunteers from around the country will be involved in organising the weekend, making it ideal for competitors, supporters and, of course, their families. There will be a skate park, marquee and BBQ, and surf and skate movies will be shown on the large screen throughout the weekend. There will be a Big Move skateboard competition on Saturday and Sunday afternoons (weather permitting) at the purpose-built skate park. We are looking forward to seeing lots of skaters coming down to this event once again. Last year was the busiest yet on the skatepark and saw the highest number of entries in the skateboard competition.